J. Edmund Mullin co-chairs the Real Estate and Land Use Department of Hamburg, Rubin, Mullin, Maxwell & Lupin. Practicing real estate, zoning and land use law for over 50 years, he has established a noted reputation in the areas of municipal and land use law in Montgomery and Bucks Counties. Ed represents Fortune 500 companies as well as emerging businesses in industries ranging from oil producers through pharmaceuticals to retail businesses. He not only deals with townships and boroughs, but with PennDOT, DEP, and the county conservation districts for NPDES permits. Two of his major attributes as an advocate are first, his friendly relationships with municipal officials and staff and second, his ability to construct effective solutions without going through a lot of red tape. Long committed to serving the legal profession and real estate community, Ed serves as Chairman of the Joint State Government Commission charged with rewriting the real estate laws of the Commonwealth of Pennsylvania. Ed has served as a member of the Board of Directors of the Montgomery Bar Association (MBA) and also as its Treasurer, Secretary, Vice President, President-Elect and President. 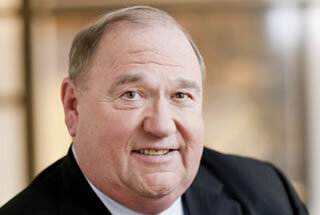 He is a past chair of the MBA’s Community Outreach Committee, and a past President of the Montgomery Bar Foundation. Ed is also active in the Pennsylvania Bar Association where he is a member of the Pennsylvania Judicial Evaluation Commission as well as a retired member of the House of Delegates. He is a member of the Legal Action Network for Development Strategies (LANDS), which is a group of approximately 200 attorneys nationwide who work with the National Association of Home Builders. Ed is also a member of the American Land Title Association’s Title Action Network, a group formed to communicate with legislators, statewide and federal, on issues affecting the land title industry. In addition, Ed is a Founding Member of the Irish-American Society and a member of its Board of Directors. He is a past member of the Board of Directors of Continental Bank, which merged into Bryn Mawr Trust Company. Ed received the Muhlenberg Award for Leadership from the Historical Society of Trappe and was named to the Hall of Fame of the Homebuilders Association of Bucks and Montgomery Counties. He has been consistently named to the Pennsylvania Super Lawyers list since 2004 and was selected by his peers for inclusion in U.S. News and World Report’s Best Lawyers in America2014-2019. He was named the Best Lawyers®2019 Land Use and Zoning Law “Lawyer of the Year” in Philadelphia. “Lawyer of the Year” recognitions “are awarded to individual attorneys with the highest overall peer-feedback for a specific practice area and geographic region. Only one attorney is recognized as the “Lawyer of the Year” for each specialty and location.” Ed is a retired member of the Board of Consultors of Villanova University School of Law. He served for 20 years on the Montgomery County Community College Board of Trustees, and was head of the Century Club Committee of the Muhlenberg House Restoration Project of the Trappe Historical Society. Ed is also on the Board of Trustees of Mercy Career & Technical High School and was Chairman of the Board at Saint Mary’s Villa. He received both his undergraduate (B.A. 1963) and his law degree, Order of the Coif, from Villanova University School of Law (J.D. 1966). Named the Best Lawyers®2019 Land Use and Zoning Law “Lawyer of the Year” in Philadelphia. Named to the Pennsylvania Super Lawyers list for Land Use/Zoning, 2004, 2006-2018. No more than five percent of the lawyers in the state are selected by Super Lawyers each year. Successfully represented Mother Teresa, pro bono, when a municipality tried to keep out one of her shelters. Represented a developer in Bucks County who desired to build affordable housing in an exclusionary township. After studying the township’s ordinances and applicable law, a curative amendment was formulated which, upon filing, led the township to settle the matter without any hearings in a favorable light for the client. Represented a local farmer who was denied a variance to erect a farmer’s market on his property in which food products other than those raised on the farm could be sold. Through a carefully crafted plan, diligent research and local interviews, Ed was able to successfully resolve the issue by organizing hearings where strong community support for the proposal was demonstrated, and the Board of Supervisors had to give permission in the face of the public outpouring. Represented scores of individuals and commercial clients in buying, selling, subdividing and developing real estate for numerous individuals and commercial clients. Represented buyers, sellers, lenders, partnerships and syndications and has successfully assisted each with their real-estate needs.